With the ride progressing at a speed of hundreds of kilometers per hour, the pupils of our eyes begin to dilate. The amount of light entering the pupils keeps fluctuating throughout the ride. The pupils try to increase their ability to focus and keeps contracting and expanding rapidly to create a clear image of things appearing forward. The moment the coaster begins to move, our brain begins to sense a change. 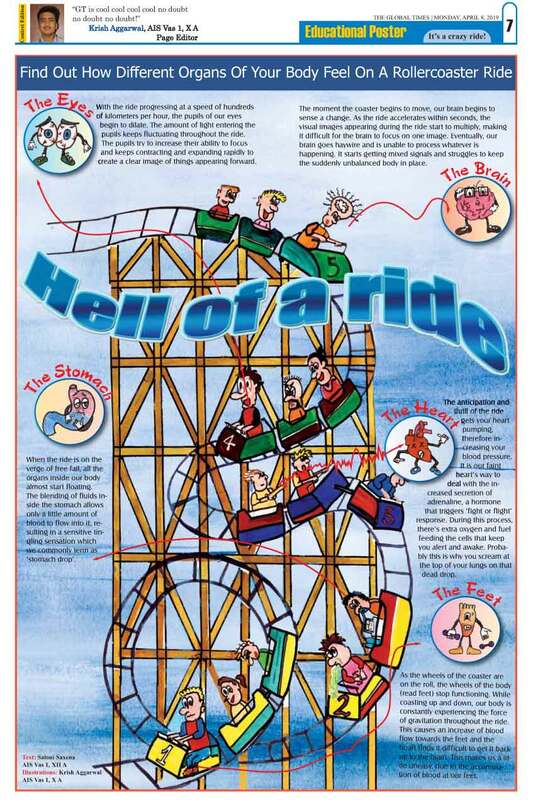 As the ride accelerates within seconds, the visual images appearing during the ride start to multiply, making it difficult for the brain to focus on one image. Eventually, our brain goes haywire and is unable to process whatever is happening. It starts getting mixed signals and struggles to keep the suddenly unbalanced body in place. When the ride is on the verge of free fall, all the organs inside our body almost start floating. The blending of fluids inside the stomach allows only a little amount of blood to flow into it, resulting in a sensitive tingling sensation which we commonly term as ‘stomach drop’. The anticipation and thrill of the ride gets your heart pumping, therefore increasing your blood pressure. It is our faint heart’s way to deal with the increased secretion of adrenaline, a hormone that triggers ‘fight or flight’ response. During this process, there’s extra oxygen and fuel feeding the cells that keep you alert and awake. Probably this is why you scream at the top of your lungs on that dead drop. As the wheels of the coaster are on the roll, the wheels of the body (read feet) stop functioning. While coasting up and down, our body is constantly experiencing the force of gravitation throughout the ride. This causes an increase of blood flow towards the feet and the heart finds it difficult to get it back up to the brain. This makes us a little uneasy, due to the accumulation of blood at our feet.